Richmond native John Dooley served in the First Virginia Infantry Regiment between 1862 and 1865. The Dooleys were one of the South’s most prominent Irish-American families, and counted figures such as John Mitchel amongst their family friends. Both during and after the conflict John Dooley recorded his experiences in the Confederate army, offering an insight into not only Irish service in the Army of Northern Virginia but also Southern Irish advocacy of the Lost Cause. Robert Emmett Curran has compiled a new edition of Dooley’s writings, published as part of Peter S. Carmichael’s Voices of the Civil War series with The University of Tennessee Press. John Dooley’s father John Senior had emigrated to the United States from Co. Limerick in 1832. He eventually became the owner of an extremely successful hat-making business, the Great Southern Hat and Cap Manufactory, based in Richmond. A pre-war Captain of the ‘Montgomery Guards’, John Senior served at First Manassas with the Irish militia unit, which by now formed part of Company C, 1st Virginia Infantry. John was forced to resign due to advancing years in April 1862; his eldest son James received a dangerous wound at the Battle of Williamsburg a month later which would also eventually force his departure from the 1st Virginia. John junior joined the regiment in August 1862 at the age of 20, thus maintaining the family’s connection with the unit. Some of John Dooley’s writings about the American Civil War have been previously published by Joseph T. Durkin, in his 1945 John Dooley, Confederate Soldier: His War Journal. However much of this was abridged and large parts of Dooley’s original writings omitted, principally as a result of the confused nature of the archive. Dooley did not write a straightforward narrative account of his time in Confederate service; instead his diary is formed from a number of different manuscripts written at different periods of his wartime and post-bellum life. Initially serving as a Private in Company D of the 1st Virginia, Dooley was present at battles such as Second Manassas, Sharpsburg and Fredericksburg. He had risen to become a Lieutenant in Company C by the time of the Gettysburg Campaign, where he was wounded and taken prisoner during Pickett’s Charge. He spent the following years as a prisoner of war, before being paroled in February 1865 during the Confederacy’s dying days. A devout Catholic, John Dooley decided to become a Jesuit after the war’s conclusion. He died at an early age in 1873 as a result of TB, perhaps brought on by his prolonged time in the field and in prison. There are many interesting details to be found in John Dooley’s writings about the Civil War. He communicates the often monotonous life of soldiers on campaign (and later in prison), and the tedium and repetition that such an existence involved. His description of being a part of Pickett’s Charge at Gettysburg is a fascinating insight into the experiences of one the participants in that most famous of Confederate assaults. Dooley reserves his most vivid descriptions of the battlefield and it’s aftermath for his time as a wounded soldier awaiting treatment on the field at Gettysburg, when he encountered a horrifying array of wounded and disabled men during his long wait at a field hospital. Amongst the other common themes in Dooley’s writings are his family’s close relationship with the Irish patriot John Mitchel. John Mitchel’s son Willie served with Dooley, and the two were friends-Willie was among those killed during Pickett’s assault at Gettysburg. Dooley provides an interesting account of his and fellow Confederate parolee’s efforts to keep up with the ever shrinking Confederacy after Appomattox in 1865, as they journey from town to town in Virginia and North Carolina seeking to keep up with the fleeing administration and searching out Confederate forces. One of the more interesting aspects of John Dooley’s service is that he held the unique position in the 1st Virginia Infantry of being the only non-commissioned soldier to be accompanied by his own slave, Ned Haines, presumably one of the 10 listed as belonging to the Dooley family in 1860. Ned joined Dooley on campaign in 1862 and was with the Irish-American as far as Gettysburg, helping to forage and construct shelters for him and his messmates throughout the Eastern Theater. We learn nothing of Ned’s fate following Dooley’s capture in the summer of 1863. 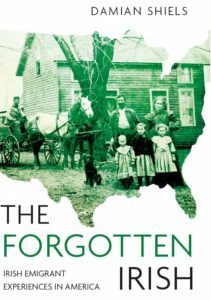 Robert Emmett Curran has done an excellent job of editing these important writings, which provide a window into the war and post-war views of some of the more affluent members of the Southern Irish-American community. Copious notes present valuable additional detail which compliment Dooley’s narrative, particularly with regard to later ‘Lost Cause’ additions. For anyone seeking to understand the viewpoints of many of those Irish and Irish-Americans who fought with and staunchly supported the Confederacy, John Dooley’s Civil War is an essential addition to your bookshelf. Curran, Robert Emmett (ed.) 2012. 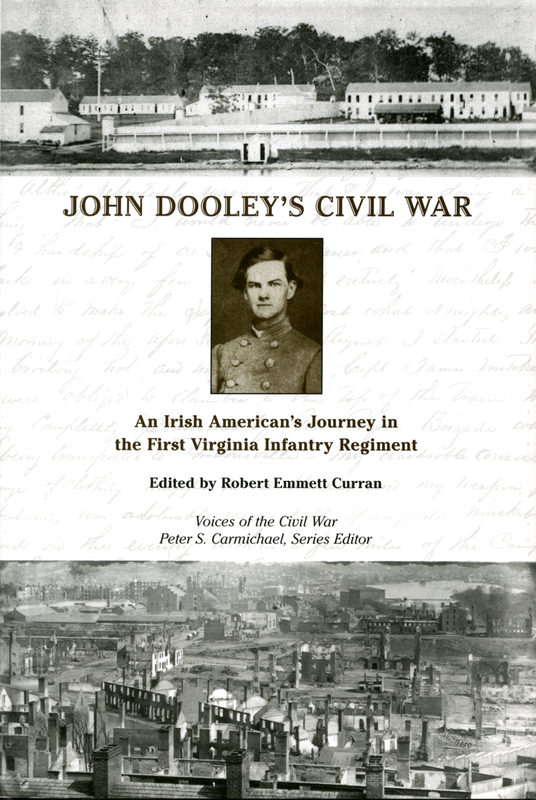 John Dooley’s Civil War: An Irish American’s Journey in the First Virginia Infantry Regiment. 516pp. Thanks for bringing this work to light.